We made the mistake of choosing a table right in front of Heng Huat's stall, and the lunchtime crowd offered no chance of a second seating. A hipster with a skateboard and unruly beard occupied the next row, sandwiching us against the lone Malay stall in that section of Pasir Panjang Food Centre, whose owner was calling it a day, having disposed of his morning stock of curry puffs, sweet potato fritters and assorted kueh-mueh. We made a mistake, for every minute or so, after Ah Huat had stirred a plate of kway teow and smothered it with an unnaturally thick crown of lightly fried chye sim, he would grab hold of a whistle and blow the bojangles out of it. Each shriek easily reaches the far end of the food centre and slaps down all conversation in Ah Huat's corner. It silences the nasal whine nearby and bounces off an ageing port worker in overalls who dribbled gravy on the floor as he slouched by with a hand of Hokkien mee. Ah Huat blows and beckons without apology until he catches the eye of each customer, who bears the burden of ignoring persistent calls to pick up their order pronto and put paid to the din. Maps indicate the presence of a park beside the food centre, but forget to add that it is now a lot more paved. Still, mature sea almonds tower above the vehicles and offer shadows that make the mid-day slightly less maddening: smokers, nappers, drivers and other slackers cluster in the shade to wash down their meals, wait for the next delivery or let their minds wander in a space that is more gray than green. Weaver ants, dislodged by the breeze, land on random heads and are brushed off shoulders onto the wayside, where grass blues flutter and fight over coat buttons, goatweed and touch-me-nots. The street directory also fails to fully mark out a canal that runs behind the food centre, separating the cars from the wharves and bridging the woods of Kent Ridge Hill to a long-buried beach. The public side of the waterway, once named after the nypa that must have lined its banks, is guarded by a low fence that allows curious bucks to lean over without taking leave of their senses. The railings hail from a sadder time; the stakes are modest and rough hewn, a dirty wash of white, stained by lichen flakes and infested by salticids, some bearing setae that mask their flanks, others sporting bars that holler at mates. A shiny solitary wasp hovers and halts, but she posed no threat to the spiders, being a fiend only to vermin from the gravy train. There are few tidal drains these days, when the Kallang Basin and Singapore River flounder and drool in their dotage into a bay of fresh water and financial plenty. But ditches on the peripheries of the island still suffer regular invasions by the straits and Sungei Nipah offers a view of the front line. Figs loom over the water, harbouring in their branches families of scaly breasted munias which descend when the coast is clear to hop on algal mats and pluck at loose filaments. A scarlet-backed flowerpecker and two yellow-vented bulbuls swoop into the trees, drawn perhaps by clumps of tropical mistletoe. Painted jezebels also lurk by, seeking the hemiparasites not for their fruit but their foliage. Plain water and salty deposits also lure a spotted dove and striped albatross to these confines, where they sip within sight of crescent perch that play in rivulets on a bed of sand and urban sediments. A bright red dragonfly, possibly Urothemis signata, stands guard, with his tail to the sun, from a twig that forms a miniature arch above the stream, but later abandons his post when post-noon shadows engulf it. Another odonate, Pantala, floats nearby, gliding, cruising, banking, braking, pushing the limits of its wing loading and straining against the elements that meet, mingle and melt into each other in this zone of convergence and confusion, of flux and fluctuating concentrations of salinity and sweetness, of brooks forced to abide by right angles and granted no chance to linger and wonder where it all went wrong. Tiny flats have formed among the flotsam and crumbling ledges on the flanks of the canal, and in this landscape of bottles, boards and other broken things play little crabs and lithe mudskippers, which amble in silty pools and dine from man-made lookouts. A house shrew patters through the gaps on the concrete, while a polyclad flatworm with the colour and composure of phlegm slides over shards of damp goo. Just a few metres downstream of the dragonfly, a population of creeper snails appears on the mud, marking the point where the stream dries up and the sea begins. Something caught the eye of the men by the fence: two blue-spotted mudskippers, noticeably larger beasts than the gobies on the fringes, were foraging close to the current, swiping their gapes from side to side as they inched forward on stubby pecs. The larger of the pair raised his flag every now and then, whenever the other crawled towards him. But both fish were more concerned with lunch than love, and gave just lip service to the business of courtship, which on this lonely stage offered meagre competition and modest reward, the promise of all too familiar faces in a circle that has grown so narrow there is little left to discover other than the scraps of faults entrenched. It should be stated at once that there is no established industry in sponge-fishing in Malaya... local sponges were occasionally fished and cleaned by the Malays for toilet use by the Asiatic population generally. It is noteworthy that cleaned and bleached Malay sponges, cut into small pieces and packed in cellophane, can be seen exposed for sale in a number of Chinese shops in Singapore, and retail sales appear to be increasing. 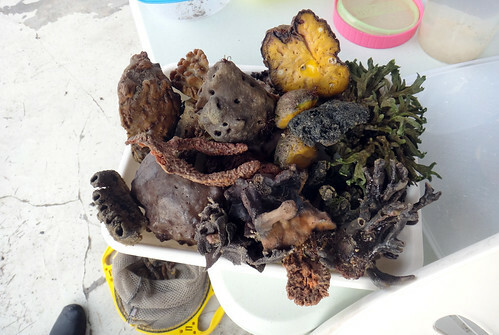 Local sponges are obtained from the coral reefs and islands adjacent to Singapore, such as Sudong, Rhio and Ubin, and from the more distant Dutch islands. The winning of sponges from the sea and their preliminary cleaning is almost entirely in the hands of Malays from the islands who have always shown skill as fishermen and seamen. But it is perhaps significant that there is no specific word in Malay for sponge, the term 'gabus' being used also for a cork or stopper. On the other hand the collection, sorting, trimming and marketing in Singapore – still the entrepôt of so many tropical products – is exclusively in the hands of the Chinese. 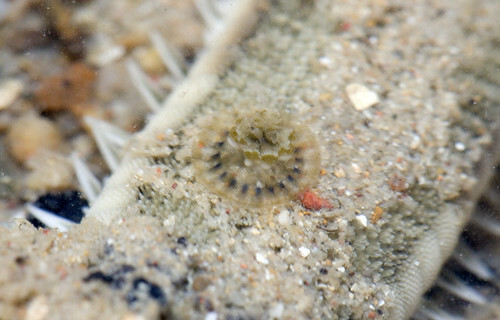 Malayan sponges are usually found on coral flats in water which is about one foot deep at low tide. The Malays believe that a depth of one to six feet is the most favourable for the growth of sponges. 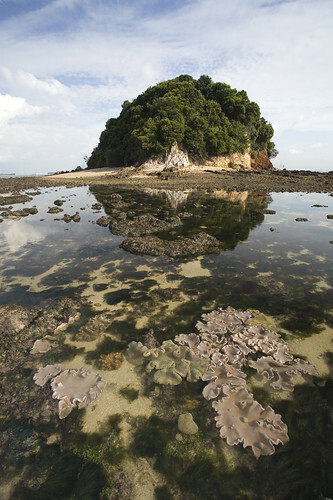 At Pulau Sudong the Malays go as far as to state that at depths greater than two fathoms sponges cannot be located. 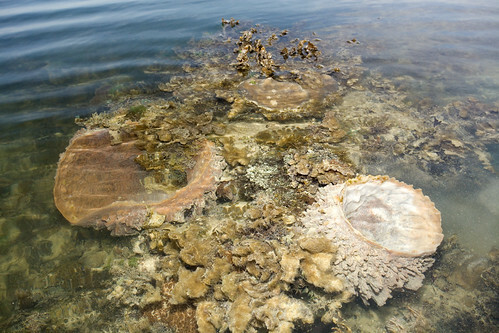 In Malaya the method of collection being by hand, the Malay is able to take a catch of sponge from the reef only at favourable low tides, which may occur two to four times a month. The system of wading in to the sea up to the neck is not practised in the Malay Archipelago. The opacity of the water, the existence of strong currents, the confused and uneven bottom, and the possible presence of sharks render this method impracticable. Even with the beds uncovered as at low tide it requires not a little experience to be able to recognise a true sponge in amongst the varied flora of the coral reef. In its natural habitat the sponge appears black, is of the consistency of tough beef liver, and exudes a characteristic but not unpleasant odour. – Stanley G. Willimott, 'Malayan Sponges'. Journal of the Malayan Branch of the Royal Asiatic Society, October 1939. But it is small islands that loom largest in contemporary consciousness. They are the objects of our most intense desires and the locus of our greatest fears about environmental degradation, even species extinction. We feel extraordinarily free there, but also trapped. Associated with pleasure, islands also habour pain, for they can just as easily be prisons as refuges. Isles remind us of our isolation as individuals while sustaining visions of community; and though unparalleled as places of solitude, they are also among the few places we feel cosmically connected. The edge of the sea is a harsh place, a borderland of elements at odds, a battle line where two worlds take turns to invade each other's spaces and impinge on slopes that must endure a daily change of guard between sallow straits and a stony island. 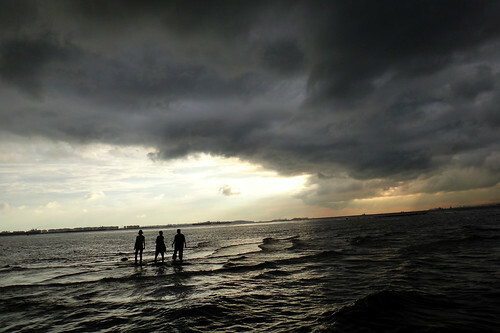 At the eastern fringe of Pulau Ubin, on a promontory that straddles two channels and overlooks a flat of grassy beds, rain, wind and unmitigated earthworks sweep soil, wood, dirt and other terrestrial fragments towards rivulets that run to the shore, while the waves and rising tides send lines of jetsam and discarded resin to the high water mark, where they join heaps of Ulva and drift seeds in search of coastal settlements to form a layer of decay, of dead and dying things, that do little for lovers of long walks on clean beaches but offer a smorgasbord of flesh and fraying fibres for diners with greener habits – beachhoppers, ghost crabs, pigs out of sty, seaweed flies, monitor lizards, dog whelks, mynahs in raucous gangs. The edges of Chek Jawa are too steep, too narrow, too hemmed in by the sea and a wall of trees to provide much of a beachhead for low, ground-hugging vegetation. But the sheared crowns of some of the outcrops that guard this cape provide, in parts that receive dunkings only from the most severe of storms, footholds for a herb that has lost its grip on mainland shores. On these plateaus of unpolished granite, foliage, petals, fruit and seeds from durians, nutmegs, sea almonds and fan-flowers drop, or float on seasonal breezes, into shallow basins and miniature faults – what remains after the monsoons have taken their toll is a sliver of humus, an ounce of sediment too thin even for unruly grains but enough to sustain populations of a wildflower that grows prostrate on stems bearing a spiral of fleshy leaves and tufts of axillary 'hair' resembling the hides of shrivelled hamsters and which must have struck Linnaeus, for he dubbed this plant the 'pilose purslane'. Their habit is ungainly and lacking in lushness, but Portulaca pilosa ssp. pilosa makes up for the sparsity with a constellation of delicate, rosy-pink blooms that light up the tips of its shoots and evoke, in the pale whorls that threaten to envelop the corolla and bracteole, Venus in furs, stars in a swaddling of vegetable fibres. 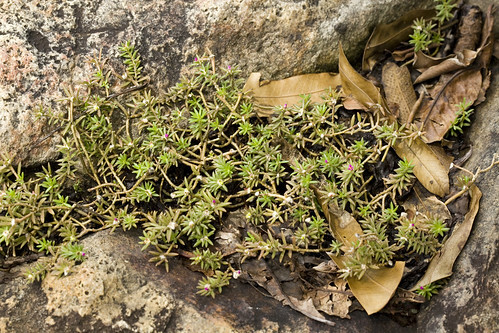 The hairy portulaca, which flourishes on ledges inhospitable to most other plants, owes its survival to photosynthetic pathways that allow it to thrive in water-stressed habitats. Evident on its leaves are a branching network of dark green lines indicating dense bundles of chloroplasts which receive carbon dioxide solutions in saturations that fuel growth in hot, dry conditions. Another mechanism may come into play during periods of drought, namely the ability to accumulate carbon dioxide after hours when the plant can stop holding its breath and open its pores to let in the sour stuff without losing too much fluid; come daylight, when the stomata are closed, dissolved gases stored in pockets to spare are shunted to the chloroplasts for conversion into sweeter bonds. 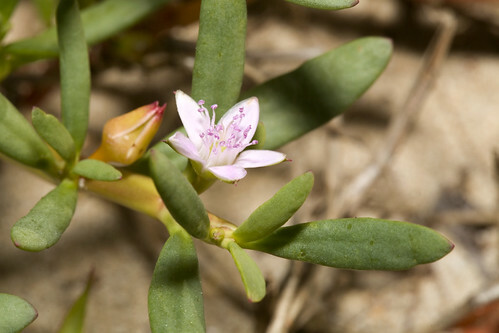 Local colonies of Portulaca pilosa – which may never have been common, for they escaped even Ridley's notice – appear restricted to rocky or sandy coasts: littoral deserts too dry for true halophiles, too bare for bushier flora but not nearly too wild for them fighting words don't come easy go hard or go home, truly. 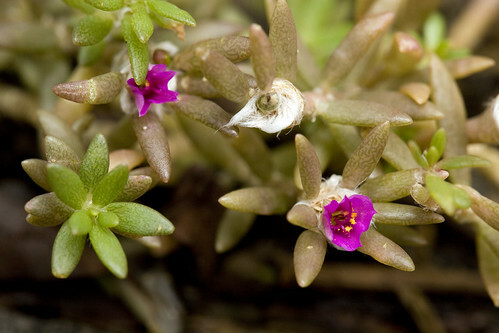 A different succulent, one formerly thought to be allied to Portulaca and named accordingly, still occurs in considerable densities on the upper end of exposed beaches, such as those of Pulau Semakau, Pulau Hantu and isolated stretches of Changi and Lim Chu Kang, where they emit a satisfying crunch underfoot en route to deeper parts. The herb probably suffers little permanent damage, for it is a diffuse, decumbent being that sprawls on stems secured to the ground by roots from regular nodes. The flowers, which share a base with the thickish but narrow leaves, are a far lighter, more delicate, shade of pink, but as the greenish tips suggest, consist of five coloured sepals rather than soft lobes, which frame a cluster of slightly darker stamens. Vast carpets may have tinged the lower reaches of the Geylang River in centuries past, for this waterway and the surrounding district are said to have been named after gelang pasir, a plant that is variously identified as Sesuvium portulacastrum or Portulaca oleracea. This botanical muddle matters not in times of callous appetites, for neither the provenance of a neighbourhood nor knowledge of natural histories that shaped recent landscapes can match, in debt and flavour, the pursuit of gastric availment through island geographies in nomen eet numen. The tiniest of jellies bobbed by as a hairy crab dragged a common sea star over a bed of pneumatophores at Pulau Hantu, while the sky was still dry and the sun dripped with soft, warm beams that lost their way and gave up hope before breaking down on the cusp of an uneventful horizon. It was the teeniest of constellations, a blob no bigger than a nymphal barkfly, a phasmid egg, a button shell that died before its time – its ring of arms still a mere smudge on a flopping disc. The bell, ajar and agnostic to the drama writ large, wobbled its way to the aboral surface of the star, a mat of loose pebbles and prickly bars, where it sampled last light before the day caved in and petered out before a chorus of motor rhythms and blue notes from an island of small red pokka dot com bubblegum crisis on main streetwise ground foolish heart of darkness in a city of tyred screams. Cassiopeia may have traded her earthly realm for celestial reaches, but her avatar at sea occupies a narrower fief: inshore flats, lagoons, bays and seagrass beds in a planetary belt of warm waters where the scyphozoans can lounge topside down and graze on sunshine, flexing their concavities every now and then to keep the goods flowing. 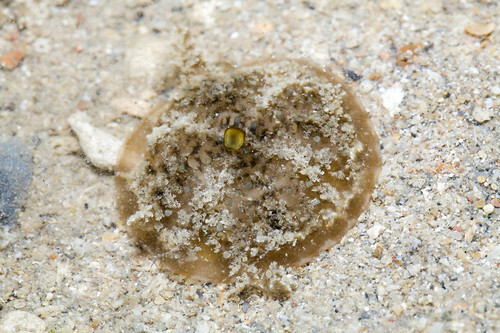 Locally, the jellyfish, in various shades of grey, brown and green, are more often spotted at Pulau Semakau, occupying the thin rad line between the trees and the trough that sweeps past the western flank of the tethered island. Some planulae may have drifted to more haunted parts and coves inviting to nestle amid the pneumatophores of aged pioneers. But these polyps remain by and large transient indulgences, for the muddy banks between two shackled phantoms discourage loiter, especially when the tide is fleeing, floundering, falling in streaks, forming minor estuaries, miniature bores through capes of sand, crumbling in surrender to syndromes of lunar withdrawal, deltas of venus in furs, a storm in a cup on tea placed on the boil for far too long and just waiting to blow over unwind cut loose and wade beyond the gap in the wall and watch the world beneath the waves, a riot of bodies aglow, aflame, ashamed, tepid and in thrall to the embrace of spirits that never cease their wonderings even when the worst is over and work turns to war.